Mr. Nashville: Is Dolly Headed To Destin? Florida's Destin Log newspaper is sharing whispers that Dolly Parton may be bringing one of her dinner theater attractions to their area. Property reportedly sold for $4.25 million dollars was purchased by the investment company which does business as Dolly's Pirate Voyage and Dixie Stampede are owners of the property. John Paul Somers Realty sold the property and told the paper they couldn't divulge the future use of the property but an exciting announcement would be coming in the upcoming weeks. Okaloosa County Growth Management Director Elliot Kampert said he and Destin officials have met representatives for the project. The Dixie Stampede has locations in Pigeon Forge (close to Dollywood) and Branson, MO with a location in Myrtle Beach operating for years, until it was revamped and re-launched as Dolly's Pirate Voyage. All have been very successful. TMZ reported last Halloween that Dolly was in Los Angeles and purchased Pirate's costumes at Trashey Lingerie. So maybe she's gearing up to publicize the announcement and opening, if it's indeed true. 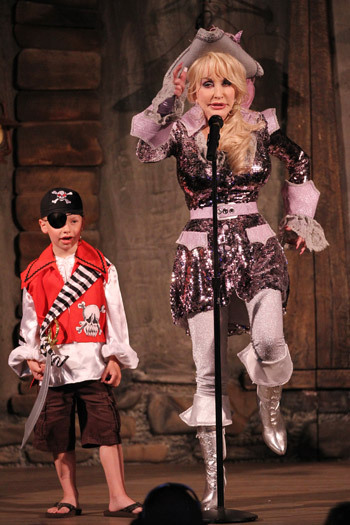 Wouldn't it be great if Dolly would bring her Pirate's Voyage to Nashville?